For the young Stephen Shore America was Manhattan, and its beating heart was Warhol’s Factory, where, forsaking college, he practised his photography. Then one day a friend took him for a road trip. Photographs of meals and feet, you say? Like the kids take nowadays with their instamatic iPhones? The answer is yes; Shore got there first and critics didn’t know what to think at this blatant middle finger to the traditional black and white photography art world. And then he moved on to Uncommon Places, a document of a seemingly never ending road-trip and the belated subject of this review. His established style of the traveller’s observed detail carries on into this book. Banality of on the road – pancakes, sugar bowls, faces he’s briefly met. One photograph shows a McDonald’s meal, looking far from happy. Another photograph features a bathroom at a Holiday Inn. They intersperse the remote landscapes of the book and provide an on-going consciousness of Shore’s presence. In the space between each picture rests the unseen knowledge that Shore has seen something passing through, pulled into town, checked in and checked it out. And this time no photo exceeds his remit as a traveller. Rumpled beds, feet on a chair, a TV in the corner and a somewhat more wholesome breakfast on a table form a gentler, more casual scrapbook, far less startled and harsh subject matter as compared to American Surfaces. Subsuming these little moments in something greater vision, he captures the small town surroundings as a vast landscape in a bold, detailed, authoritative fashion. The labour of pulling out his cumbersome large plate camera bestows a sort of studied archival seriousness to these outdoor photographs, in the act of taking them and through painstaking process he bestows upon his subject matter a documentary importance. Later, he became self-aware of this and ironically donned a safari jacket, playing the role of the ethnologist. But there’s a refreshing lack of pretention in Shore’s work. There’s no clumsy reaching for social statements regarding banality or consumerism in his large canvases. He’s confident enough that the American landscape speaks for itself, and his clever use of motel life snapshots underscores that banal ‘nowhere’ feel while at the same time placing you alongside him on his aimless journey. Here’s something strange, I opted to put on a record by Aaron Copland while flicking through the book. Laid on my bed, I turned the pages as his resoundingly heroic orchestral piece ‘Rodeo’ played. I expected the superior pleasure of irony to cut a grin in my face. Instead I just found myself really, really wanting to visit America again. Shore’s straight-up delivery of urban space and motel life was so transparently engaging and so curiously epic that I just wanted to wander the places he captured. Did he feel the same way? I think so. Nobody spends eleven years on a project stretching coast-to-coast, endlessly shoving bank notes into pump jockey’s hands, without having some sort of love for the subject matter. I think Shore’s is a self-aware love, acknowledging the emptiness but finding something irresistible in the psycho-geography of roadside America and the delicacy he can bring to it with the blessing of just the right light. He rejects the temptation of superiority, places himself within, not above. And these photographs are beautiful, they really are. It’s an uplift of the rawer, darker style of American Surfaces, where those glowing-eyed dogs and greasy fried eggs offered their repulsive intrigue. Of course, the photographs are technically superb. composition of his many intersections and parking lots, splitting the canvas up into blocks of brick and asphalt and chrome, drawing leading lines with power cables and placing punctuation marks with signs and that rare, slow moving pedestrian. Then there is that beautiful Kodak colour, a truth and softness that seems more natural than the harder punch of most digital work. He uses light with grace, eschewing the overwhelming hues of sunrise and sunset but looking for that soft, warm light under blue skies that makes for an airy, breezy, open space. You can feel a cool touch upon the cheek just looking at some of these photos. They are photos you can stand inside. Not surprising since, according to ARTFINO's Philip Gefter , Shore and his contemporary William Eggleston studied the photo-realist painters of American landscape, artists who made glistening hyper-real studies of telephone booths and Americana. With this talent he eked beauty and harmony out of the commonplace. This was the key to Shore’s success and it put him in the vanguard of the ‘New Topographers’. A discipline of transforming mundane urban landscapes; of making an Ansel Adams Yosemite view out of a freeway overpass or market street. Perhaps that safari jacket was the right call after all. It was this that makes Shore’s work so special for me. They are memorable visions, a mixture of common constructs with that little difference that makes them stand apart from the herd, or an imposing purity of self that makes them archetypal. A towering office-block on a deserted street becomes every office-block while a small, white, roadside chapel against a spectacular backdrop of distant mountains becomes freakish, a mythic locale of Americana worthy of Stephen King. Multi-coloured light bulbs in a shop window. A primitive calculator sat like a one-armed bandit in an empty storefront window. These are the things that catch the eye when a traveller passes through, a scrolling backdrop on their interstate journey. No wonder Shore’s prior book was called American Surfaces. He captures people very well too. Ginger Shore looks distracted and beautiful, her red hair and freckles in a red shirt against a tiled orange wall. Later, she lowers herself carefully into one massive pool of crisp blue water. Craig Nettles of the Yankees is pictured, in a rare aside from his road-tripping, swinging a bat in Florida in a shot completely lacking dynamism – just some guy. (This may be because Shore’s camera was built for detail, not speed.) We get a bald guy in a vest scowling as he stands before his clapboard house. A dignified businessman in a smart suit looking faintly anxious. An African-American couple touching heads together in an easy embrace, looking direct to camera. And then there’s the odd glimpse of Stephen Shore himself. And again, it is the colour and delicate natural light in these shots that is so mesmerising. So I love his work, and if you’re bored and in a gallery browsing mood you can see that his new topography vibe has infected my work too. I spend ages trying to get that Stephen Shore look in post-processing. I think I’ve got his crisp light blue skies right, but I can’t quite get those fresh, bright, matter-of-fact greens. I hope he doesn’t frown at my attempts to emulate his old style; after all, imitation is the sincerest form of flattery. 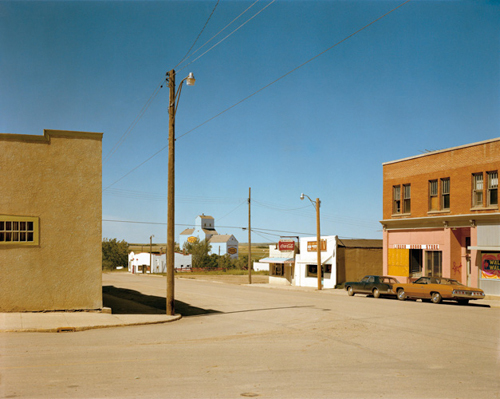 Stephen Shore’s ‘Uncommon Places’ is without doubt my favourite photography book and my biggest inspiration. For that reason it gets to awkwardly kick off this blog. It is published by Thames and Hudson and is worth every penny. Buy it. Stephen Shore, 'Artists Statement', Aperture printing of Uncommon Places, 1982.